Just completed Communion Of Dreams, and was delighted with the story! In fact, I sat with my Kindle, a good pipe and spent the time to read it front to back in one sitting. Its been a long time since I found a story that captivated me like this, a joy to read and keep. Thanks for the wonderful work, this is what good fiction is all about, a storyteller with a good tale and and time to enjoy the story in the telling. Isaac has arrived. I think already today we’ve had more rain than we’ve had in the previous two months, perhaps longer. Last I checked the forecast is for another 4″ or more over the course of the weekend. No flooding yet. Not of either the weather nor the ideas variety. That’s OK. These things arrive when they do, like kindly reviews and comments in the email. They say Isaac will be paying us a visit. I’ve previously talked about the Drake Equation, and how new information from a host of sources is changing the calculus of expectation — expectation of what is waiting for us out in the universe. Drake equation: How many alien civilizations exist? I’m in a somewhat weird headspace right now. Maybe that’s the reason for it. We’re suffering such a drought that it seems almost surreal that there may be rain this weekend. And not just a little rain: current forecast models say between two and six inches, most of it in about a 24 hour period. That won’t break the drought, but it would cause flash floods. Similarly, I’ve been thinking — and thinking hard — about the Kickstarter for St. Cybi’s Well. But all my thoughts seem to be random, chaotic. Nothing will quite ‘gel’, to use another reference from Communion of Dreams. But when it does, I think there will be a flood. That’s the title of a NYT article a friend sent me. It’s long, more than a bit depressing, and probably something that every aspiring author should read. More than that, it’s probably something that every book consumer should read. Because if you’re going by book reviews listed online, well, you might be reading nothing more than “artificially embellished reviews” in the words of one former business owner who brokered such reviews for authors. There’s no easy answer, for either a writer or a reader. Ideally, you should be able to read a review and tell whether the person actually read the book or not. But you can’t trust that. Believe me — I wrote advertising copy for several years after college and before grad school, and I got to the point where I could convince almost anyone that whatever product I was writing about was *FANTASTIC* whether or not I had ever even tried the product, let alone whether I liked it. Any competent writer could churn out ‘reviews’ for books they’ve never read by the dozens. So, what then? Because reviews really do make a difference — having a solid body of honest reviews has helped others decide to give my books a try. That’s why I keep asking people to do them: it helps. A lot. But what I think helps even more is word-of-mouth. Well, the internet equivalent of it, anyway. Which is people — real people — posting their thoughts/recommendations about a book on their favorite forum/blog/twitter/Facebook wall. I haven’t hit this mechanism nearly as much as I probably should since the initial launch of both Her Final Year and Communion of Dreams, but that’s because I hate bugging people. But I’m going to swallow my pride and ask when it comes time to kick off the Kickstarter Project for St. Cybi’s Well that I keep mentioning. In fact, I can pretty much guarantee that the Kickstarter will either succeed or fail according to how much promotional support it gets from people who have read Communion of Dreams. So if you read that book, and enjoyed it, and would like to read another component in my over-arching story — be ready to help spread the word. Thanks. In advance. There will be more tangible expressions of my appreciation coming soon. Have a shot of oxygen. There are a lot of ways we die. Massive trauma. Heart failure. Diseases of the organs which cause other body systems to shut down. But one of the more common mechanisms of death is lack of oxygen in the blood, what is called hypoxemia in the medical community. Without adequate oxygen in your blood, your brain and other organs start to die at the cellular level within minutes (in most conditions). Hypoxemia can be caused by many different things, including a wide range of diseases and a variety of trauma. But if you can keep the blood oxygenated, you can buy time to treat the underlying cause. In the case of someone who has drowned, for example, this can be as simple as CPR. In other cases a heart-lung machine can keep someone alive while awaiting a transplant. n a new study, published online today in ScienceTranslational Medicine, he and colleagues report the development of microparticles filled with oxygen gas that can be injected directly into the bloodstream. The particles quickly dissolve, releasing the gas and keeping organs, such as the brain, from suffocating. The microparticles are tiny bubbles whose surfaces are membranes already used clinically to administer chemotherapy drugs and ultrasound dyes. But while those microparticles release their contents slowly, Kheir and his collaborators designed oxygen-containing particles that would dissolve as soon as they hit the bloodstream. They then tested the microparticles in rabbits breathing air low in oxygen. Within seconds of receiving the microbubbles, the levels of oxygen in the rabbits’ blood rose from a dangerously low 70% to nearly 100% saturation, the ideal level. We have developed an injectable foam suspension containing self-assembling, lipid-based microparticles encapsulating a core of pure oxygen gas for intravenous injection. Prototype suspensions were manufactured to contain between 50 and 90 ml of oxygen gas per deciliter of suspension. Particle size was polydisperse, with a mean particle diameter between 2 and 4 μm. When mixed with human blood ex vivo, oxygen transfer from 70 volume % microparticles was complete within 4 s.
As noted, this is based on very proven technology: liposomes. These lipid-bilayer artificial “cells” are commonly used to deliver drugs in the bloodstream, and they are very well understood. This new application changes the liposome construction so that it dissolves much more quickly, allowing the oxygen to infuse the bloodstream almost instantly. It is currently in animal trials. But based on how well the technology is understood, and the potential benefit it offers for a wide variety of life-saving applications, we could easily see this approved for human trials in the near term, and available for deployment within a few years. I’ve finished Communion of Dreams. Sir, had I read it before I met you I feel certain that I’d have behaved differently in your presence. And the world was changed forever. Death wins. We all know this. They knew it during the early years of our space program, and there were even contingency plans in the event of the death of the crew on the Apollo 11 mission. Neil Armstrong himself thought there was only about a 90% chance of his returning from that mission, as well as only a 50/50 chance that they would successfully land on the Moon (which he always considered the most important aspect of the mission). But it is a risk which is worth taking. Yesterday, after finding out about Neil Armstrong’s death, I spent the rest of the day thinking about the man, reading about him. Probably the most telling thing is how he lived his life after retiring from NASA. As has been often cited (even by me – and again I recommend the very rare interview he gave last year ), the man was remarkably self-effacing. He didn’t take credit for being the first man to set foot on the Moon. He didn’t exploit the fame which had come to him unwanted. He could have easily cashed-in on his status, reaping riches for endorsements, becoming a permanent celebrity. Instead, he joined a small university program as a professor of Aerospace Engineering. Endorsements (of a very limited sort) and serving on the Board of Directors for several large corporations came later. But he still kept a very low profile, trying to live his life as much like a ‘normal’ person as he could. Can you imagine how difficult that must have been? In a world where celebrity distorts everything — where even my modest accomplishment with one self-published novel would prompt someone to react differently to me — Neil Armstrong managed to live and die without it completely warping who he was. I honor his place in history as the first man to step foot on the Moon. But I admire him much more for who he really was. That depth of character is what made him a hero. Another small step for a man. Wow – Neil Armstrong has died. I find that I am incredibly sad at this news. There isn’t much else to say. 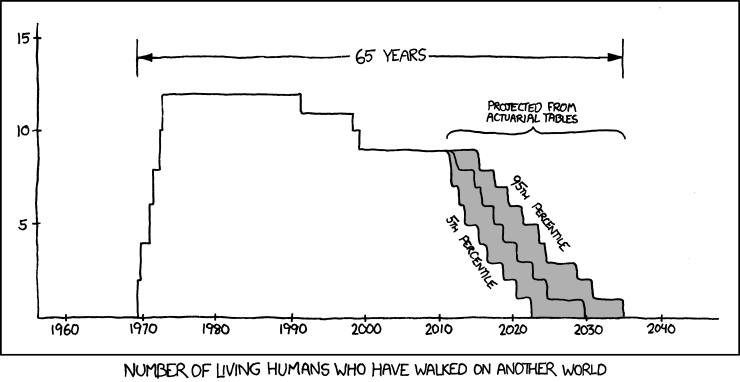 Image from xkcd, of course. I’ve written before (even recently) about the tree in the image at the top of this page. It’s locally known as the “Williamson Oak”, named after the family which owns the property where it grows. It is, simply, magnificent, and the oldest/largest such tree in the world. John Sam Williamson releases 850 gallons of water at the base of the 350-year old champion bur oak at McBaine Wednesday. Six generations of his family have owned the land since the 1830s. Williamson plans to release roughly 1,600 gallons of water around the base of the tree each week for the next several weeks. Yeah, this drought is bad. The worst I’ve ever seen.